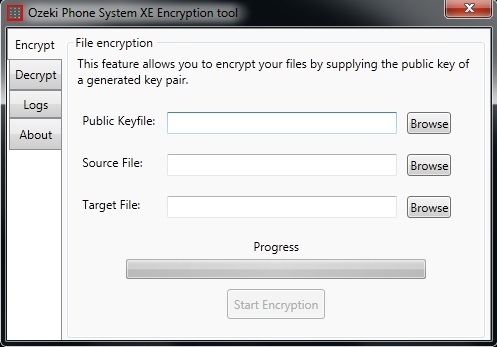 This article introduces the Ozeki Phone System XE Encryption tool, a great and comfortable option to encrypt or decrypt your files with public or private keys of RSA algorithm. With this tool you are able to browse to your files and RSA keys and create new encrypted or decrypted files with the help of these keys. It is useful when you set up the encryption security in Ozeki Phone System XE for call recordings and you want to decrypt these recordings. If you had set up a call recording rule with file encryption, then you had to get the private key of the RSA key pair. You will ned this key to decrypt your recorded call. 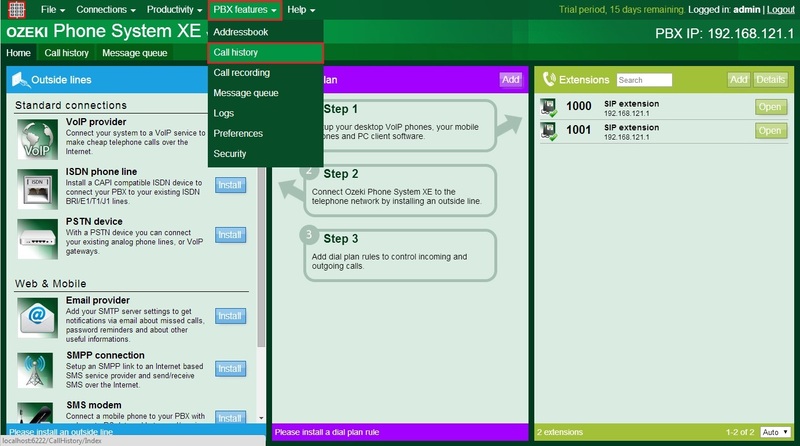 Open your Ozeki Phone System XE with your personal account (username and password), then find the call history menu option to download your former telephone converstations. 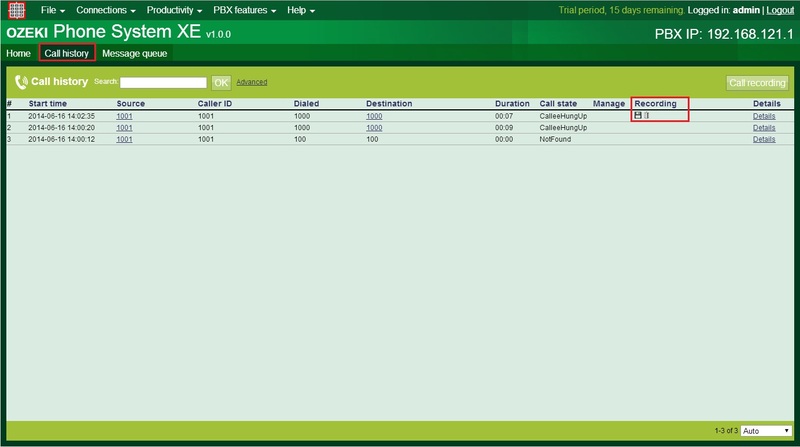 Select the PBX features tab on the top of the screen, then the Call history menu option. As you can see you can find all of your former calls here with some information like start time, source, caller id etc., and there is a save icon, where you have set up a call recording rule. If you click on this icon, you will be able to download the saved converstation. It will be an encrypted file so you need to decrypt it first to reach the original format of the call. To decrypt the call recording, use the Ozeki Phone System Encryption tool which is a great app for encrypting and decrypting files such as the call recordings. 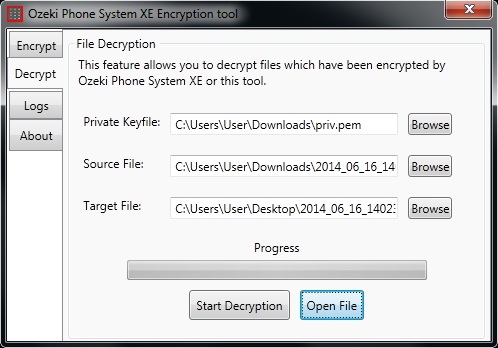 After the file download, run the Ozeki Phone System XE Encryption tool. You can notice that you are able to choose between four options in the application: encryption and decryption to encrypt and decrypt your selected files with specified RSA keys, logs to inform the user about processes and about to the user can read about this product and Ozeki Ltd. Choose the decrypt tab, then find your private key to decrypt your call recording file. You can find the private key at the location where you saved it after RSA key pair creation. Then choose the downloaded call recording file with the help of browse button. Finally select (or create) a target file for the decrypted audio file. The progress bar will show you the status of the decryption. When the process has finished, you can open the decrypted file with Open File button. Ozeki Phone System Encryption tool is a great solution for protect your files with RSA encrypt and you are able to decrpyt the encrypted files easily also with this application. If you generate a keypair with Puttygen or Ozeki Phone System XE (find article about generating encryption keys here) and encrypt your call recordings (or other files) with the public key, you will be able to decrypt them with the private key and Ozeki Phone System XE Encryption tool.